STORIES OF ALIEN CONTACT GONE WRONG. Will it be, "Greeting, fellow Sentients" or, "Nice Planet--we'll take it"? These stories from SF greats answer the question, "Are we alone in the universe?" with a resounding, "No, but we wish we were "
When the first contact between humans and aliens from another planet happens, will they say, "Take me to your leader," or is "Surrender, puny primitive bipeds" more likely? Or maybe, "Hello there, I'm selling the latest edition of the Galactic Encyclopedia, and no planet should be without a set," might be the first words from the alien visitor. Ever since H.G. Wells wrote The War of the Worlds, science fiction writers have speculated on what the first contact might be like. From attacking invaders to wise and benevolent visitors who are ready to solve all our problems for us, from horror stories to hilarious satire, with all the stops in between, including plenty of tales in which the aliens are the ones who wish they'd stayed at home and never come across Earth and its inhabitants. 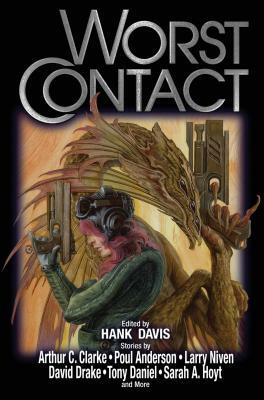 With stories by such science fiction masters as Poul Anderson, David Drake, William Tenn, Sarah A. Hoyt, Tony Daniel, and more, this is a collection filled with chills, thrills, and laughter, all reporting on what happens when First Contact turns into Worst Contact. Hank Davis is Senior Editor at Baen Books.